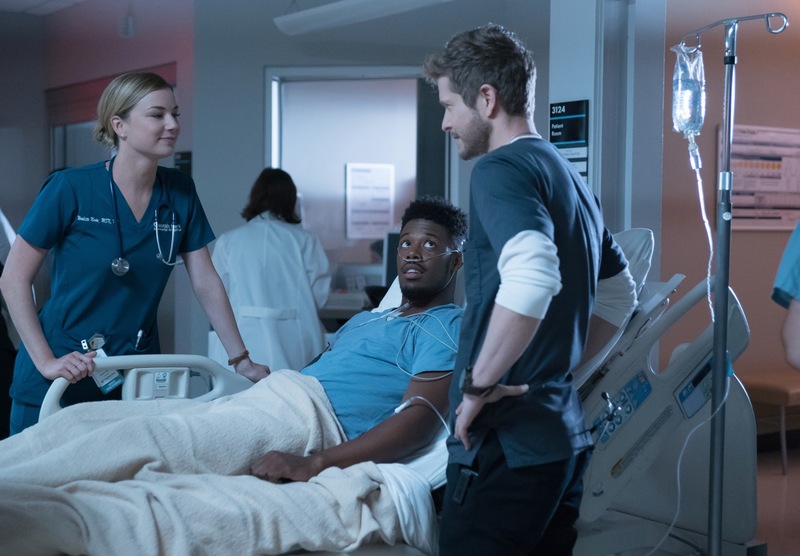 First-look photos from the second season premiere of FOX’s The Resident have officially dropped, and although details and loglines on the Sept. 24 premiere have yet to be released**, Fox promises that the season ahead will be a fraught one for the docs and residents of Chastain. Season 2 will find Conrad (Matt Czuchry) continuing to make difficult calls in the best interests of his patients. However, having rekindled his relationship with Nic (Emily VanCamp), the two now must face unresolved issues from their pasts. Meanwhile, Conrad’s father, Marshall (Glenn Morshower), has taken over as head of Chastain, and comes into direct conflict with the hospital’s newly minted CEO, Dr. Randolph Bell (Bruce Greenwood). And while Mina (Shaunette Renée Wilson) continues to work with her larger-than-life mentor, Dr AJ Austin (Malcolm-Jamal Warner), the skills of new ortho surgeon Dr. Kitt Voss (Jane Leeves) could just ead Mina on a different path, altogether. Finally, our first-year resident Devon (Manish Dayal) becomes intrigued by new medical device rep Julian Booth (guest star Jenna Dewan, Step Up), whose presence at the hospital will upend business as usual for everyone there. The season kicks off with episode 2×01, titled “00:42:30” on Monday, Sept. 24 (8:00-9:00 PM ET/PT) on FOX. Follow our official Twitter @ScreenSpy for more scoop from The Resident. Guest Cast: Tasso Feldman as Dr. Irving Feldman, Patrick Walker as Micah Stevens, Michael Hogan as Dr. Albert Nolan, Denitra Isler as Nurse Hundley, Jessica Miesel as Nurse Jessica Moore, Vince Foster as Dr. Paul Chu, Jason Turner as Dr. Dale Simich, Andi Matheny as Dr. Kelly Whitley, Rico Paris as Enrique Diaz, Tate Ellington as Jason Thoms, Adrienne Whitney Papp as Melanie Thoms, Justin Calalay as Paramedic Fred Tanner, Cyrina Fiallo as Rachel Bird, Emily Tosta as Joplin Bird, Viviana Chavez as Nurse Reena Reddy, Kelly Tippens as Nurse Linda Smith, Ann Marie Gideon as Nurse Sylvie Pund, Melanie J. Newby as Nurse Lora Day, Kendrick Cross as Chief Medical Officer Ben Kothari, Mary Shaw as Dr. Mary Bolton, Devon Hales Lisa Logan, Ian Covell as Charles Simm, Andrew Hunter as Radiologist Grayson Dees, John Forbes as Dr. Wilson, Ethan Corn as Heli-medic John Akerman, and Nicole Sellars as Connie Klein. THE RESIDENT Season 2 Premiere "00:42:30"